Many of us have travelled the globe with Amma, and we have found that each place She goes to has its own “flavour.” If you were to ask people what distinguishes Calicut from other places, you would almost certainly hear an emphasis on the devotion and enthusiasm – not to mention the size of the crowds. This northern Kerala city has been blessed by Mother’s annual visits, and by the installation of one of the first Brahmasthanam temples in 1993. Now Her visits are such a major event that when you reach the city you know She is coming not only by the publicity banners and posters all over the town, and a huge cut-out of Her standing form at one of the main intersections of the city, but by something thus far seen nowhere else: large orange stickers with black letters in Malayalam pasted across the front windows of many buses. They say, “Brahmasthanam vazhi”, (meaning, “Route to the Brahmasthanam”). Any buses that come to the neighbourhood of Mother’s temple bear this sticker so that anyone from any part of the city can, for a very few rupees, reach Mother’s programme. And they come. By the thousands. Each day’s darshan total is from eight to ten thousand – and sometimes more. When there are more, Mother must average not just 900 to 1,000 hugs and murmurings an hour, but 1,200 to 1,500 per hour. Someone once coined the phrase, “the Calicut clip”, for this pace; when you watch it on a video, you have to check to be sure you’re not playing the tape on fast forward, as one devotee after another is drawn swiftly to Mother’s face for a quick kiss, a hug, a whispered word and a packet of prasad. And what about the devotees – they wait for hours on end in the heat and dust, in long queues patiently, inching ever closer to their goal. One who has never experienced Mother’s unique form of darshan would not be able to comprehend these people’s willingness to make such an effort for a second-and-a-half embrace. But they come back, year after year, for the hug that sustains them, the grace that changes their lives. The exact hour when Mother will arrive in Calicut for Her visit is never known for sure – no one knows how long She’ll spend at the river nor how many stops She’ll make along the way to bless people’s homes with Her visits. So, by late afternoon, people begin waiting at the ashram, and as “possible arrival time” nears, the crowd swells. Things are quiet and peaceful as devotees and volunteers wait, some working on last minute decoration projects, or constructing temporary thatch roofs to shade large portions of the ashram land where devotees will await their turns for darshan, or sweeping the pathways and grounds, and so forth. Others sit chatting, or chanting their mantras. All are awaiting the signal that Her car has been spotted, and when that signal comes, there is a total transformation in the crowd. Everyone jumps up and rushes as close to the entry pathway as possible, hoping for a touch or a glance from Mother, or at least a glimpse of Her. Devotee volunteers line the pathway, hands interlocked to keep an open passage for Amma. They have to be strong, for the moment Mother steps from Her car, there is a surge comparable only to the sea’s waves straining at high tide towards the shore. Hundreds of voices are calling out, “Amma! Amma!” as She moves slowly from Her car towards the lighted oil lamp of welcome. As She walks, She pauses here and there to reach out and touch the hands stretched towards Her; to kiss a baby, or perhaps even carry it for a moment; to wipe someone’s tears; to bow Her head as someone stretches across the barrier of “guards” to garland Her. Upon reaching the oil lamp, Amma pauses long enough for the traditional welcoming pada puja (the ritual bathing of the Guru’s feet), and more garlands and more quick embraces, and then begins the journey to the steps that lead up to the level where Her room awaits Her. The crowd gets even more carried away now, everyone longing to be close to Her before She, who has just appeared, disappears. She reaches the bottom step, and starts to climb. Knowing the longing of Her children’s hearts, She pauses on the first landing, high enough above the crowd now for more to see Her and be filled with joy. She gazes long and lovingly around, making eye contact with one after another of the upturned faces of love. She turns and looks out, away from the temple, into the yard – for indeed, there are devotees out there, too, some prepared to spend the night on the ground so as to be in the queue as soon as it formally opens in the morning. 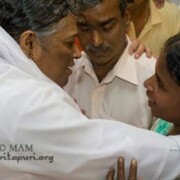 She showers them with smiles and they stretch their arms up: “Amma! Amma!” they call out. She climbs further up the stairs, and for a moment is out of sight; but no one leaves, for there is a special tradition at Calicut: when She reaches the door to Her room, right above the temple stage, She will give one last “darshan”: the curtain will be lifted, and She will gaze down. What must be the sight from Her vantage point? Hundreds of upturned faces, smiling and crying in the joy and relief of Her presence; hundreds of arms stretched high, as if the hands might somehow touch Her. She stands for a long time, gazing first into this woman’s eyes, then into that man’s, then over there at that family cluster, and then at the lone old person at the fringe, afraid to stand closer and risk being crushed. She gazes, and smiles, sometimes points at someone and calls out something. Framed by the colourful garlands She has kept on all this time, Her face is radiant – and are those tears in Her eyes, mirroring the tears of love in the eyes of Her devotees down below? Then She is gone. The curtain drops. People wait a minute or two, hoping somehow that She will change Her mind and come back. Then, almost as if by magic, the crowd disperses. Some go back to their work: they have to continue setting up the sound system and stage for the morning’s programme, or chopping vegetables and cooking rice for the next meal, or setting up lines and token-distribution points and all the booths that attend a Brahmasthanam programme: bookstalls and an incense stall, canteens and a medical emergency centre, information tables and token counters, and more. Many of these people will work all night, and some in fact sleep only an hour or two (whenever and wherever that bit of time can be snatched) for the next four days. Just as at all of Amma’s Brahmasthanam programmes, the formal schedule begins at six in the morning: archana (the chanting of the Divine Mother’s thousand names). Then chai (tea). Another archana. Breakfast. Another archana – this the most crowded, for at its end Mother will (probably having already spent some time seeing VIP’s or holding a press conference in Her room) come down for bhajans (devotional singing), satsang (a speech), and, of course, darshan. What is amazing is that however hot and humid the atmosphere, however crowded the premises, however long the wait for devotees or the effort for Amma, each person does, finally, reach Her embrace, and in that moment of contact, She who knows all of their needs, even without being told, can share the joy of this one, offer encouragements to that one, cry with another, and laughingly pull someone’s ears in mock scolding – and each goes away with that inexplicable sense that he or she is understood, blessed, and loved. This is the miracle that is Amma’s darshan everywhere, but somehow the size and mood of the crowds of Calicut highlight it in a unique way. On the next-to-last and last days, along with all the above, special pujas are also done – and done not only as it is usually done, by the temple priests, for the people, but in the way Mother has established for Her children: every person who wishes to can actually participate themselves. Hundreds of places are set up, with the necessary articles such as small clay oil lamps, certain leaves, balls of clay, pots of water, and so forth. In groups of four, the participants – from every walk of life, every stage of life, every sector of society – sit together around these arrangements and carry out the steps of the puja themselves. This helps people understand Mother’s teaching that they themselves can use rituals to approach God directly – just as each one can come to Amma’s own lap.Every Brahmasthanam programme takes more or less the same form as what we have just described for Calicut; but each also has its own flavour, and unique events. One of two special events this year in Calicut was the visit of the highly respected King of Malabar, who spoke reverently of Mother, saying that occasionally God grants the devotee’s prayers, and on this day, his own had been granted, for he had the privilege of being so close to Mother and introducing Her to the community. The warmth that flowed between His Highness and Amma was apparent, both while he spoke and afterwards, when several times She held his hands, smiling into his face, and hugged him. A second special event occurred when, according to the schedule, the Brahmasthanam Programme was over. It occurred after the end of the last night’s darshan, attended by even larger crowds than before because of the preceding Shani puja, and because it was the last programme for the year. Mother returned briefly to Her room, and then suddenly emerged, made Her way through crowds as eager and pressing as those on Her arrival, and climbed into Her car. It crept out of the ashram gates, inching its way through the thronging mass of devotees, and then moved not straight ahead, towards the city, but to the right – towards the Amrita Vidyalayam, the school run by the ashram. The children had come to Mother during darshan a day or so earlier and had told Her about the exhibition they were showing: artwork, science projects, collections, and so forth. They had invited Her to come see it. How could She, with such a schedule? This way, of course: She did it “afterwards.” As She entered the schoolroom, some of the students, in a slow and exceptionally gentle and reverent manner, performed a pada puja. She was then guided through the exhibition. The warmth that flowed between His Highness and Amma was apparent, both while he spoke and afterwards, when several times She held his hands, smiling into his face, and hugged him. A second special event occurred when, according to the schedule, the Brahmasthanam Programme was over. It occurred after the end of the last night’s darshan, attended by even larger crowds than before because of the preceding Shani puja, and because it was the last programme for the year. Mother returned briefly to Her room, and then suddenly emerged, made Her way through crowds as eager and pressing as those on Her arrival, and climbed into Her car. It crept out of the ashram gates, inching its way through the thronging mass of devotees, and then moved not straight ahead, towards the city, but to the right – towards the Amrita Vidyalayam, the school run by the ashram. The children had come to Mother during darshan a day or so earlier and had told Her about the exhibition they were showing: artwork, science projects, collections, and so forth. They had invited Her to come see it. How could She, with such a schedule? This way, of course: She did it “afterwards.” As She entered the schoolroom, some of the students, in a slow and exceptionally gentle and reverent manner, performed a pada puja. She was then guided through the exhibition. She took time to look at everything, often pausing to say something special about a project or the person who had made it. But what was particularly beautiful about Amma’s visit to the exhibition was what was happening with Her hands: as She walked, and stopped, and spoke, and called out, Her hands were constantly touching, stroking – caressing the displays. What blessed articles they now became, and how blessed their makers must have felt!